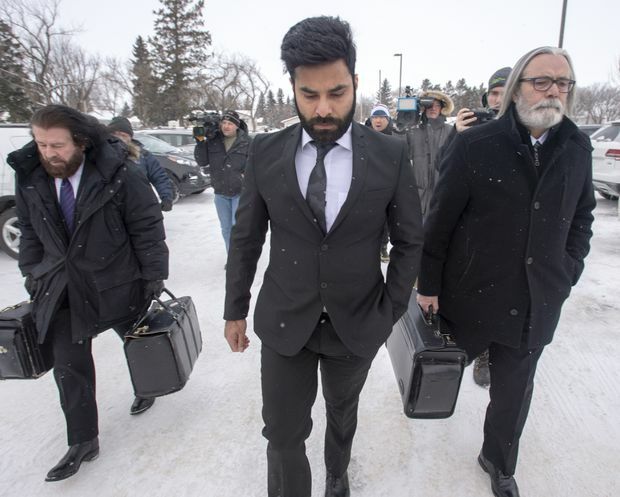 Jaskirat Singh Sidhu, the driver of the truck that struck the bus carrying the Humboldt Broncos hockey team arrives with his lawyers Mark Brayford, left, and Glen Luther, right, for closing arguments at his sentencing hearing Thursday, January 31, 2019 in Melfort, Sask. After listening for three days to gut-wrenching stories from grief-stricken families, the driver who caused the Humboldt Broncos bus crash apologized on Thursday for the collision last year that killed 16 people and injured 13 others. Jaskirat Singh Sidhu, who could be imprisoned for up to 14 years, rose slowly, adjusted a microphone, paused to take a deep breath, and began to speak quietly. It is the first time that he has made a public statement since the accident early in the evening on April 6. Mr. Sidhu’s comments came at the conclusion of the fourth and final day of an emotional sentencing hearing in a makeshift courtroom in Melfort, Sask. He has already pleaded guilty to 16 counts of dangerous driving causing death and 13 counts of dangerous driving causing bodily harm. Saskatchewan Provincial Court Justice Inez Cardinal will sentence him on March 22. Crown Prosecutor Thomas Healey requested a sentence of 10 years − he could serve less than that − along with a 10-year prohibition of driving privileges. He said the devastation caused by Mr. Sidhu is without precedent. “There is no other case like this in Canada,” Mr. Healey said in court. “Not even close." Mr. Sidhu’s attorney, Mark Brayford, requested a more lenient prison term without specifying a length. He called what happened an “unintended act.” He said there are no applicable sentencing guidelines due to the accident’s scale. The crash occurred as the Junior-A-level Broncos were en route to a playoff game in Nipawin, about a two-hour drive from Humboldt. According to an agreed statement of facts, the semi-tractor-trailer with Mr. Sidhu behind the wheel ran a stop sign at the intersection of Highways 35 and 335 and then collided with the bus. Investigators calculated Mr. Sidhu’s speed at between 86 and 96 kilometres an hour. There were no skid marks indicating that he applied the brakes. Reconstruction experts said there was nothing the driver of the motor coach, Glen Doerksen, could do to avoid the collision. Mr. Doerksen, 59, died in the crash. Skid marks that stretched 24 metres showed that he locked his brakes before the impact. Fatalities included 10 hockey players between the ages of 16 and 21, two coaches, the athletic therapist, a broadcaster, the bus driver and a high-school student on a job-shadowing assignment as a statistician. Two of the players who survived are paralyzed. Another remains hospitalized with a head injury. The other survivors sustained a range of injuries from broken bones and skull fractures to punctured lungs and lacerated livers and kidneys. Parents and loved ones of victims wiped away tears as closing statements were made. Opinions vary widely on what they consider a suitable sentence. Even those intensely angry with him have remained civil to Mr. Sidhu throughout the proceedings. Several hugged him Thursday morning. For the first time, details about Mr. Sidhu’s life were shared. He came to Canada from India in late 2013 and passed a test to become a commercial transport truck driver in August of 2017. He was hired by a small trucking firm in Calgary only three weeks before the accident occurred, and had been driving the semi-trailer on his own for only a week. In the hours before the crash, a tarp covering the load of peat moss Mr. Sidhu was carrying repeatedly came loose. He had to stop several times to fasten it. He was anxious and looking in a mirror at the back of his truck when he went through the stop sign. In the last 400 metres before he entered the intersection, he didn’t notice passing four signs warning that there was a junction ahead as well as an oversized stop sign with a blinking red light affixed to the top. The Crown prosecutor said he does not doubt that Mr. Sidhu is remorseful, but that the catastrophic results, facts of the case and mitigating factors make it a serious crime. If Mr. Sidhu, a permanent resident in Canada, receives a prison term of longer than six months, he will be removed from the country upon completion of his sentence. Victims’ families clutched tissues as Mr. Sidhu addressed them for the first time. “I came out of the truck and saw people crying,” he said. “At that time, I did not know what had happened. It took me a while to realize. He put one hand over his heart. “I am so, so sorry,” he said. Editor’s note: An earlier version of this article included an incorrect name for the defence attorney for Mr. Sidhu. He is Mark Brayford, not Mark Graydon, as published. This version has been corrected.